Owning iPad, iPhone, iPod, PSP, Android phone, MP4 player, Wii, NDS or other digital players? If it's YES, then you may have problems of how to put DVD movies, CDs, YouTube videos, or other non-supported video/audio format files on your player. 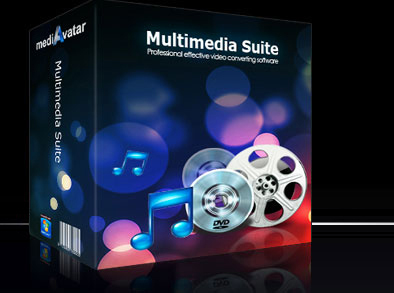 mediAvatar Multimedia Suite may amaze you with the most comprehensive conversion solutions available at highly low price! Convert video files of all high-definition and standard-definition formats (HD to HD, HD to SD, SD to SD), convert audio formats, rip and convert DVD movies to different format video or audio files, rip CDs to music, and burn audio CD, MP3 CD or WMA CD from just about any video and audio format files. All your multimedia requirements accomplished in 1 pack! With NVIDIA® CUDA™ technology introduced, the video converter converts video files at 5X faster speed than ever. Clip any favorite segments; merge any video clips into a single one; split a single file into multiple clips. Add transitional effects to merged items; crop video screen size; add and adjust subtitles/soundtracks; attach watermarks. Add and adjust fade-in, fade-out, volume normalize, band pass, chorus, flanger, echo and speed effects to your audio files. Set multiple output formats for a single file to output different format files from the same file simultaneously. Able to transfer the converted video and audio files to iPod, iPhone and PSP directly after conversion. Multi-threading and batch conversion enable you to convert multiple files in batches at high speed.